Livesay Family: Our eyes are open, but do we see? I learned a while back that kids that grow up abroad can grow up with an entirely different experience than their parents. They can and do observe and participate in the culture in their own separate and unique ways. An expat friend of ours tells a story of teaching a class at a school where many wealthy kids attend. He asks the class, "What is it you would like to be able to see or do in your life?" The high-school kids talk and name a few things. One boy says, "I would really like to visit a poor country some day." The school he attends where this question was posed, is located in Port au Prince, Haiti. That student wants to visit a poor country. Our son Isaac is many things. He is an optimist on steroids and cotton candy on a sunny day at Disney World. When the clouds do roll in, his clouds drop gumdrops instead of raindrops and it only serves to make him even cheerier. He sees life as wonderful. He rarely says things are "okay". His world has little room for "fine" - he likes it all to be "epic". He views things through his lens and doesn't necessarily willingly allow any other views to enter in. We all went together one day recently to drop a woman off at her home. She had delivered her baby at the Maternity Center and spent a couple of days recovering and bonding with her third child. We piled in and headed northwest up the coast line and out of Port au Prince. We wound back into the hills in an area where many pathetic little structures are called "home". As we parked the truck to walk down a hill to the house, I said, "Come on everybody, lets all walk Yveta home". When we neared the house, Isaac hung back --- The home was made of tarps and sticks and wood. No metal walls, no cement walls. It sits on a hill, with an uneven dirt floor. The bed is not a bed at all. It is a mat on the ground with bedding on it. I prompted, "Kids, come with me. Let's visit their home. Let's pray for them." I ask Isaac to pray in English first, promising to pray in Kreyol after him. He begins his prayer in his typical sunshine, rainbows, and unicorns fashion, "Dear God thank you for this WONDERFUL family. These wonderful people. The wonderful" .... his voice trails off. I open my eyes and say, "It is okay, buddy, not everything here is wonderful - keep going." He thanks God for the "wonderful new baby" and the blessing of said baby. We hike back up the hill toward our truck. "Thank-you, Isaac, for coming in the house to pray. That was kind of you", I say. Isaac replies, "It was hard to know what to say." He is right, of course. It is hard to know what to say. It is hard to know what to do. It is hard to keep from looking away. The materially poor, the marginalized and exploited are the ones we want to be especially sure to listen to, SEE, know, learn from, visit, and love. Cornel West is onto something when he says, "Never forget, justice is what love looks like in public." Later that day I pulled the three bigger kids in for a quick huddle. I explain that we can live right in the middle of things that are difficult and challenging without ever really seeing the very people that are daily living the things that are difficult and challenging. 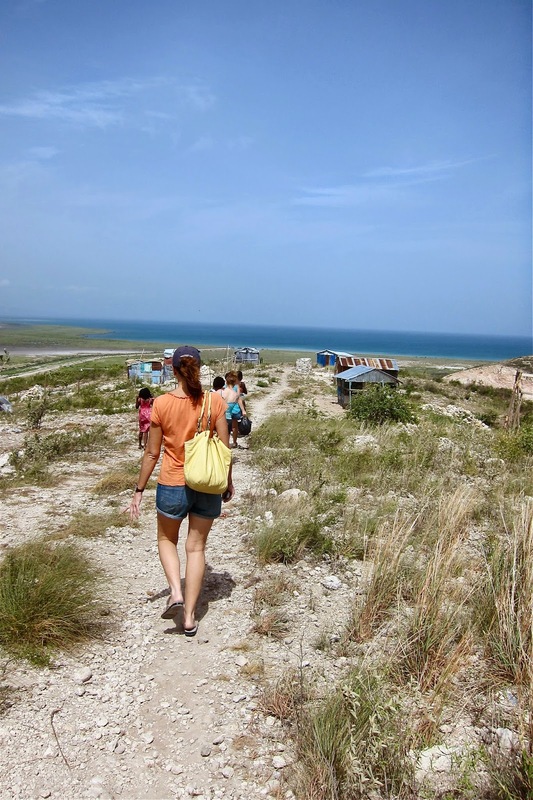 I explain that getting in our truck and driving to and from school is not real life in Haiti. I tell them that it is very important to me that they see people and by seeing them they come to care and by caring they one day want to act and by acting maybe their love will bring about justice. I remind them, and myself, of all of this. They listen closely and they nod. Later I watch them playing together and I think, even when our eyes are open, we still need help to see.